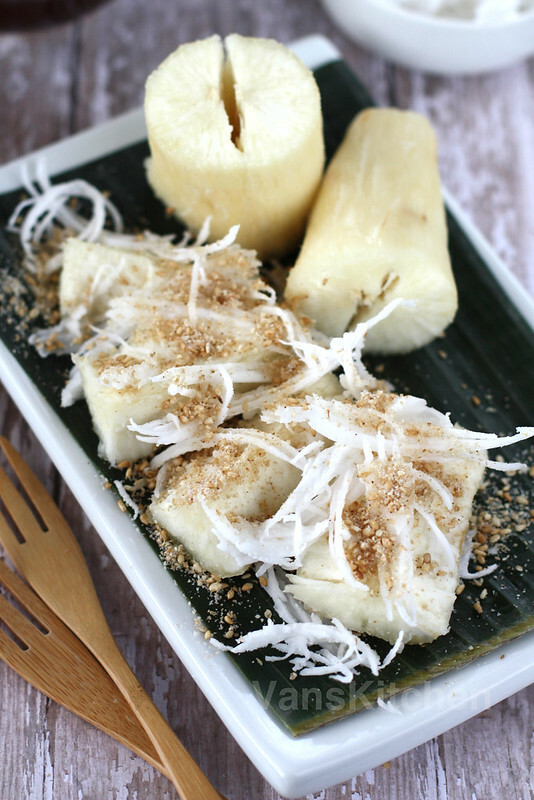 Steamed cassava with sesame condiment and shredded coconut is a delicious snack. It was a major staple food during Vietnam war, but nowadays it has became one of the most popular street foods in Vietnam. Peel the skin and soak them as long as you can (I soaked for only one night, but it may be better to soak longer if you can--18 hours or more). Then after soaking, just a few simple steps you can quickly finish a yummy snack! Cut the cassava into 2-inch long chunks. Make cuts along the length of the chunk, then run the knife along the exterior skin of the tapioca root to peel off the skin, leaving only the white flesh. Soak them in salt water overnight. The next day, wash and rinse well. Then steam the tapioca roots in a pressure cooker for 10 minutes or until a stick goes through a piece of tapioca root easily. Grind the roasted sesame seed finely, add sugar, salt, and mix well. 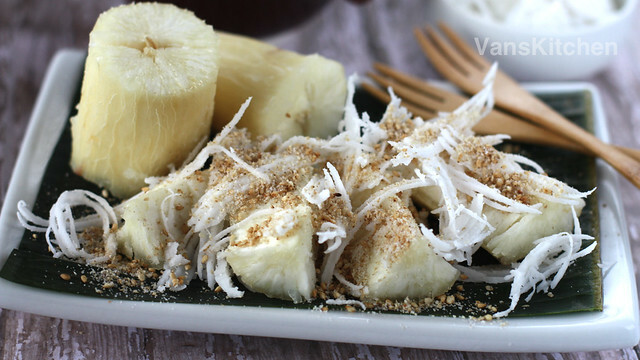 Before eating, sprinkle with the sesame condiment and shredded coconut.